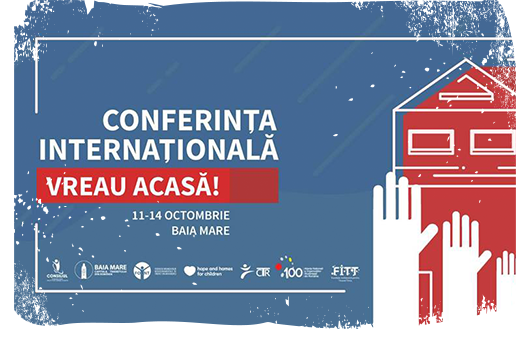 The international conference “I want a home”, hosted on 11-14 October 2018 in Baia Mare, the Youth Capital of Romania, brought together care-experienced young people, care professionals and public authorities to discuss ways forward. The conference theme “Independent but not alone” allowed participants to facilitate a dialogue on a wide range of subjects. Plenary meetings focused on the role of the stakeholders in children’s wellbeing, resilience and social inclusion, social policies for young people who leave the care system and national policies on post-institutionalisation of young people. Conference workshops included such topics as child participation, development of independent living skills and the legal framework to support young care leavers in their transition to independent living. First of its kind, the conference was organised by the Council of Institutionalised Youth, a Romanian non-governmental organisation working to advocate for the rights or children and young people with the institutional care experience. Conference partners included national coordinator of the Opening Doors for Europe’s Children – Hope and Homes for Children Romania, Federation of Youth NGOs in Maramures, Youth Council of Romania, the Timis County Youth Foundation, National Alliance of Student Organisations in Romania, Hope and Homes for Children Romania, Federation for Children’s Non-Governmental Organisations (FONPC), Ministry of Youth and Sports Romania, UNICEF Romania. Guests have also included representatives from the Ministry of Youth and Sport, National Authority for the Protection of Children’s Rights and the Council of Europe. “By bringing together representatives of the state authorities, NGOs and children and young people with institutional care experience, the conference became a platform for exchanging ideas and good practices in the sector of child welfare and child protection,” said Adrian Oros from Hope and Homes for Children Romania. The conference reached some share conclusions about ideas and solutions that can help to improve the system. Young participants suggested a number of activities to be implemented at local and national levels, including child rights information sessions, courses, cooking contests to support development of self-management skills, educational camps, the post-institutionalized youth caravan, brochures that promote the children’s rights and obligations. “We plan to implement these activities during 2019. We consider that these proposals are very good and achievable over the assumed period,” say representatives of the Council. Evidence from the Opening Doors for Europe’s Children campaign demonstrates that the general perception of Romanian public on institutions has changed over time and the majority believes that old-type institutions must be closed because they are damaging for children in the long run. Nevertheless, there is still a long way to go in terms of creating the infrastructure necessary for the institutionalised children: both for young care leavers and in terms of children going to school, accessing community services etc. Despite the fact there is no law regarding the young adults leaving institutions, there is a series of laws and regulations that mention them, and a series of standards which regulate the way one should work with young adults leaving the childcare system. Young adults leaving care have been the focus of decision makers and stakeholders for the last years. The National Package for Combating Poverty includes provisions regarding social housing for young care leavers as this has been one of the biggest challenges that Romanian care leavers face. Currently, the allocation for social housing is 5 times below the minimum, out of the total amount of accommodation needed for young care leavers in Romania. Services developed by the Child Protection Directorates, focusing on support, counselling and assistance provided by multidisciplinary teams as well as residential services that provide accommodation and counselling for a certain period of time. Services provided by private entities and bodies, mostly focusing on counselling and support for care leavers to access the labour market. Generally, children start to benefit from these services at the age of 17 (because starting with the age of 18 they can leave the system upon request) until the age of 26. The call launched in September 2018 through the ESF programme in Romania with a component on supporting young care leavers will allow for them to be supported with a wide range of services, directed both at professional life and development (securing a job, support for developing and training courses) and personal life (support to secure a place to live, covering rent costs etc). The young care leavers can also receive a wide range of subsidies in order to cover some of the needs that they might have immediately after leaving the care system. Both ESF calls come to complete the ERDF investment made in closing down institutions.